Before you think I hate Christmas, the whole Christmas season, please sit back and allow me to reason. I memorized this book at a very young age, cover to cover, word for word, page by page. I translated the book En Francais, a feat I still tout about to this day. This story is wonderful, amazing and grand. I loved it since the first day it was placed in my hand. But why in the world could a person relate? 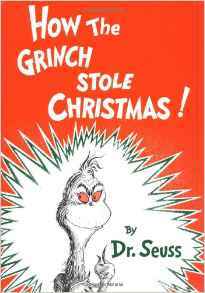 Why would anyone share the old Grinch’s fate? Christmas as an adult is expensive and hard. The cookies, the decorating, the sending of cards. Stress increases again with preparing food and drink, filling the fridge, creating dirty dishes, overflowing the sink! Stress continues to mount as the clock counts down, Forcing a smile as I carol with friends on the town. Then the stress breaks followed by a hatred of tradition, Why do we do this? Why the imposition? “The 12 Pains of Christmas” becomes my favorite tune, or “What is Christmas?” ’cause TSO is how I croon. Then Christmas Eve comes and family members arrive, suddenly the stress disappears, suddenly everything’s alive. Alive in the laughter, the joy, the tears, alive in the memories throughout the years. I remember as the Grinch learns after his uphill climb, there’s transcending magic and love at Christmastime.